The Netherlands is banning farmers from keeping fowl outdoors to try to prevent the spread of bird flu. Authorities fear the poultry could be infected through contact with birds migrating from Russia, where a strain of the virus has been found. The strain is currently not believed to spread between humans - but there are fears that the virus could mutate to a more dangerous form. EU veterinary experts are to meet this week to discuss the emergency move. Germany has said it may adopt similar precautions. From Monday in the Netherlands, five million free range chickens, ducks, geese, turkeys and other birds will have to be kept indoors - along with 80 million battery birds that are already under a roof. The country is one of the world's biggest meat exporters. The country had to cull about a quarter of its poultry after an outbreak of bird flu two years ago. 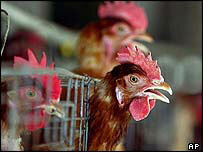 Correspondents say the government fears that a fresh outbreak of bird flu could hurt the commercial poultry badly. The Dutch decision follows recent reports from the Russian government that a strain of bird flu is moving westward - and is likely to reach Europe. The strain found in the Altai, Novosibirsk and Omsk regions has been identified as H5N1 - the type that has killed at least 57 people in South-East Asia since 2003. There are fears of a global pandemic stemming from the H5N1 type, if it mutates into a form which could spread easily from human to human.